After spending sixteen weeks in Chicago, the semester has come to a close. It has been a bittersweet end to the semester – leaving my students, after spending more hours with them than anyone else over the past few months, was extremely difficult. As I zipped up my coat to leave the school on my last day in the building, I was lovingly detained by a mob of thirty-two eighth grade students who were not prepared for my departure. I promised to visit in April, which as my students pointed out, feels much too far away. How wonderful it is, though, to have created such strong bonds with my family at Walsh. The Chicago Semester Program has done a fantastic job of placing its students in placements and internships that have given us guidance, structure, and support in this transition from college to the real world. The supervisors and cooperating teachers with whom the program partners do a wonderful job in helping our growth as professionals, and the program takes our feedback into consideration when selecting supervisors for the following semesters. I had a phenomenal experience with my cooperating teacher and could not imagine a better fit for me during my student teaching semester. In addition to ensuring its students have positive internship experiences, Chicago Semester also provides experiences and support amongst program members. 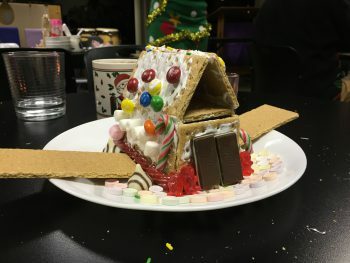 To celebrate the end of the semester, we had a gingerbread house contest and all joined in a final meal together before parting ways for whatever comes next in each of our lives. Daria and team’s gingerbread house. At the beginning of the semester, Chicago Semester had us sign up for a neighborhood visit during which we would have an opportunity to learn to navigate ourselves through the city and learn more about a specific neighborhood in Chicago. On that excursion, my group visited the Promontory Point in Hyde Park. This past Saturday, after my family loaded my belongings from La Casa into the back of my dad’s car, we drove out to the Promontory points so that I could share with them one of my very first sights in the city. I will forever be grateful for the opportunities I have had this semester, and the ways in which my experiences in Chicago have shaped me will stick with me as I move forward as an educator. Thank you all for sharing in this experience with me! 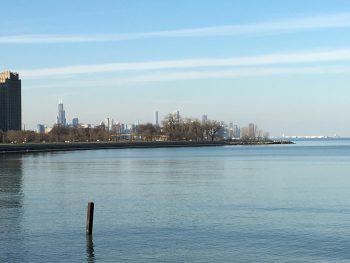 To anyone considering spending a semester in Chicago – this city and this program have lessons and experiences to offer everyone that will be invaluable in shaping who you are.